A few weeks ago, I had the delightful opportunity to spend a whole day in the country learning about organic farming here in Ontario. 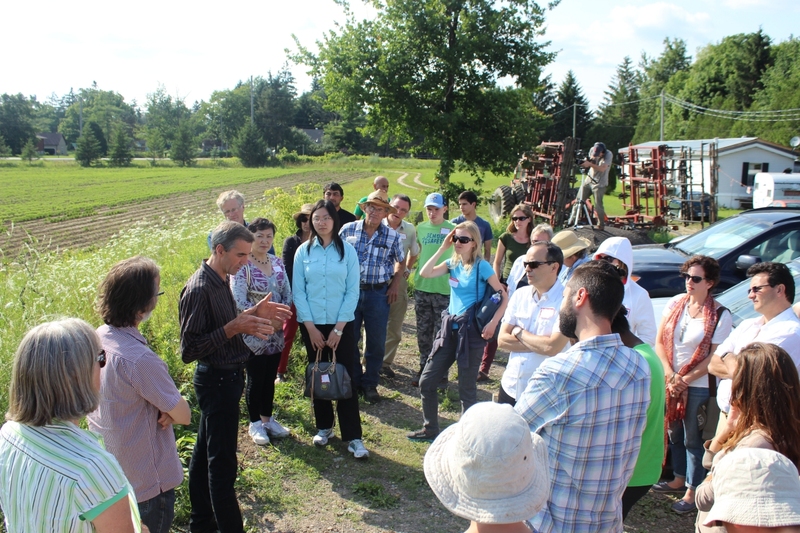 I was one of the many who took in the semi-annual organic farm tour hosted by the Organic Council of Ontario. About 70 individuals from across Ontario took part, and the tour included stops at three farms: the Boettcher Family Farm, an organic sheep and cash crop operation, the Van Ness Family Farm, an organic dairy operation, and Pfennings Organic Farm, a renowned large-scale operation specializing in growing and distributing organic produce. 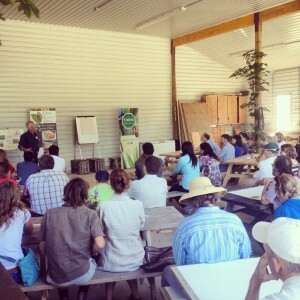 Organic Farmer Chris Boettcher explains why and how he farms to kickoff the OCO farm tour. The day started off at the Boettcher Family farm just outside of Brussels, Ontario. 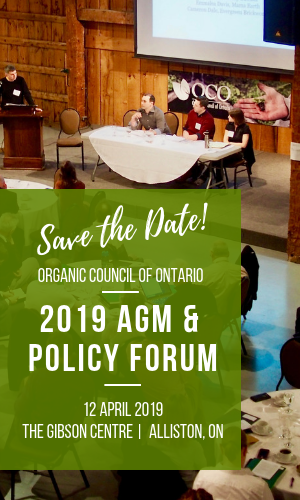 After a warm welcome from Jodi Koberinski of the Organic Council of Ontario, Chris Boettcher took to the forefront in his well-used machinery shed to tell us about his triumphs and trials with organic farming over the years. 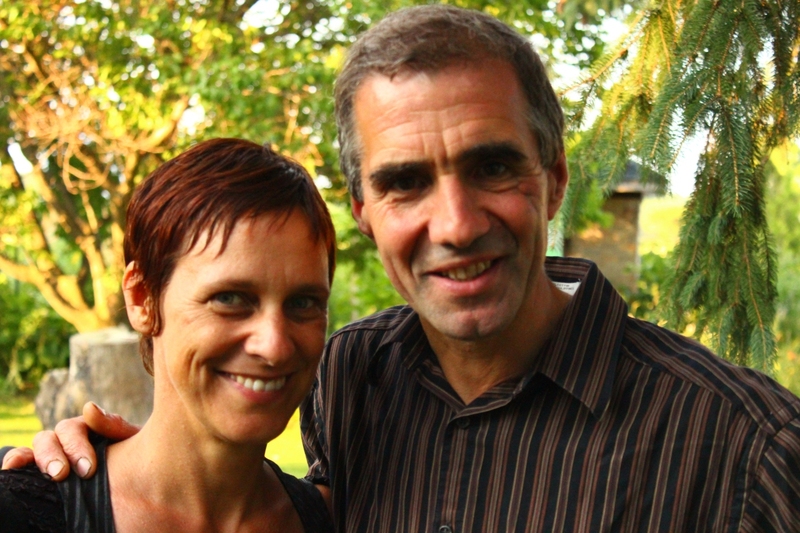 After converting to organic farming almost 20 years ago, Chris has learned a lot along the way and has a breadth of knowledge about soil health and diversity. Chris, along with his wife Gabriel and four children, grow organic peas, oats and soybeans alongside tending to a flock of roughly 350 Arcott ewes on roughly 400 acres. And, as we saw on the tour, the children also manage a large squash patch which has given them the opportunity to have their own farming project and learn about selling produce first hand. 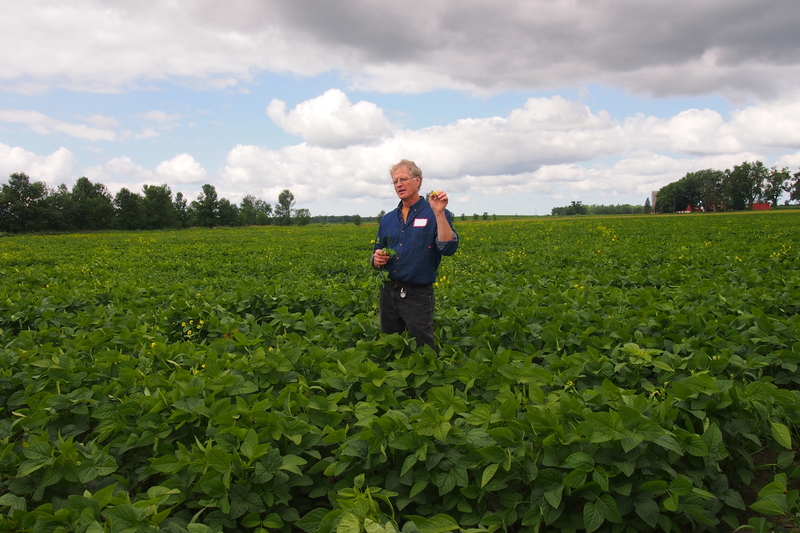 Driving through the fields, looking onto the golden oats and the healthy-looking soybeans, along with the lush squash patch, we were able to see the results of organic farming practices with our own eyes. For some in the group, it was their first opportunity to glance closely at an oat field or hold a freshly picked pea pod in their hands. 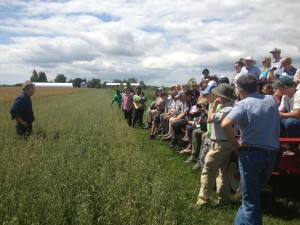 Organic Farmer Chris Boettcher discusses growing oats and spelt on the OCO farm tour. 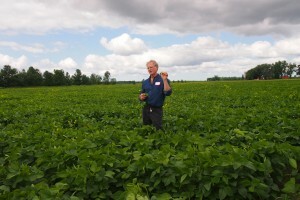 Organic Farmer Chris Boettcher discussing soybean production. These beans are destined to become tofu. 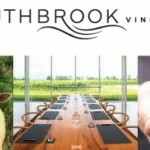 After a look at the sheep and a delectable BBQ lunch complete with a homemade cheesecake graciously provided by a neighbouring family, we all headed to the next stop, a dairy operation run by Bill Van Ness and his wife Cindy, also located near Brussels. Already behind schedule, there was no time to spare before jumping in the shuttle wagon and heading to the fields. Along the way, Bill spoke about his rotational grazing system and the influence terroir may have on milk flavour. 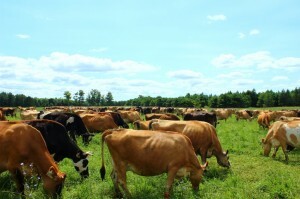 While often a beneficial trait for products like wine, Bill pointed out that for milk production terroir could be a bit of a hindrance, with uniform milk flavour often preferred. Along the way he named some of the many wildflowers growing in his pasture, such as chicory and red clover. Trying the Harmony Organic Milk. The Van Ness farm produces for Harmony. 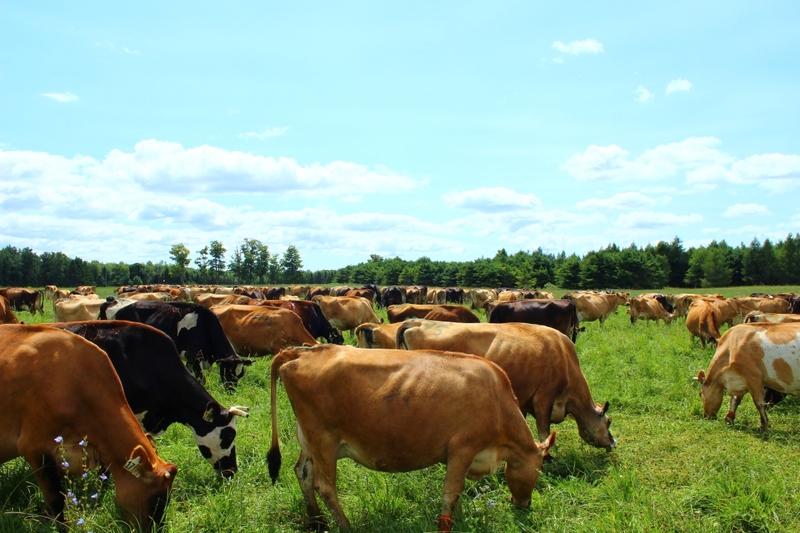 350 head of cattle produce milk for Harmony Organic, a successful certified organic dairy which sells products in over 300 health food stores across Ontario. The cows were perhaps a highlight of this stop and the tour, and many of the youngsters tried their luck at getting one of them to touch or lick their hands. The cows displayed their usual curiosity, but from what I saw no one in the group was successful at getting one of them to come super close. After many attempts to touch the cows and clicks of a camera, we headed back to the farm house where some refreshing chocolate milk awaited the group. Our final stop was at Pfennings Organic Farm just outside of Baden, Ontario. 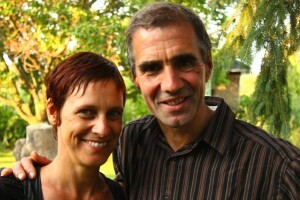 Wolfgang Pfenning introduced himself and shared the story of Pfennings Organic Farm, which began in the early 80’s. 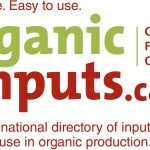 Not only is food grown on the farm, the operation has grown into a packing and distribution company over the years. The operation employs many including seasonal migrant workers from Jamaica, like many produce operations in Ontario today, who live on the farm as well. The group was quite interested in the Pfenning story as Wolfgang displayed directly that growing organically on a large scale is definitely possible. As he spoke, I noticed the striking rows and rows of green carrot tops behind him. Being quite a fan of Pfennings’ carrots, I was quite pleased to be standing near the very spot from which they come. The group was quite interested in the growing techniques used on the farm, and many questions were asked about the farm’s unique rotational growing system and approach to pests. Towards the end of the tour Wolfgang pointed out the original storage facility, which still remains intact alongside the upgraded building. The tour ended with closing remarks and another meal before we all dispersed and headed home. 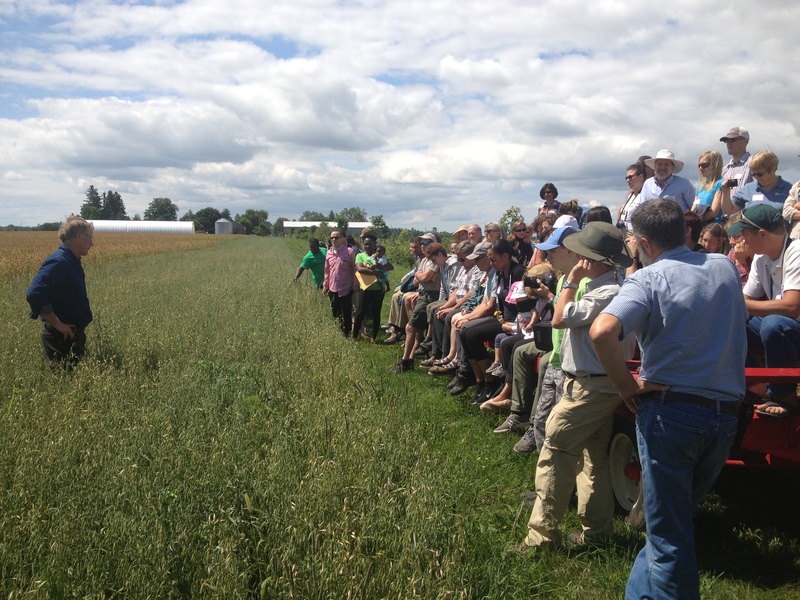 It was a day of learning out on the farms, with three farmers sharing their knowledge with the tour group. For the children, it was a chance to spend some time outdoors and get a close up look at some farm animals. 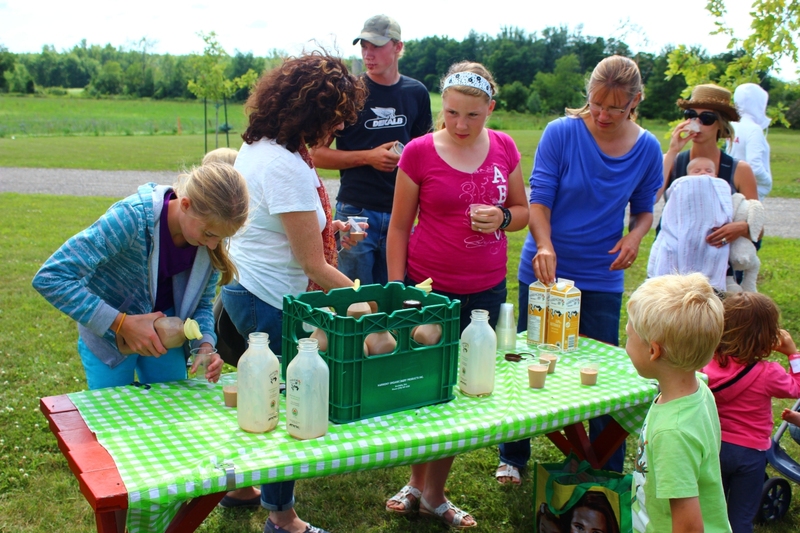 For the adults and agriculture enthusiasts, which included other farmers, business owners, public servants and more, it was a tremendous opportunity to learn about organic food production at the first step along the food chain: the farm.